The Greek alphabet originated in Greece in the late-800’s B.C.E. (Before Common Era) and derived from the Phoenician alphabet. 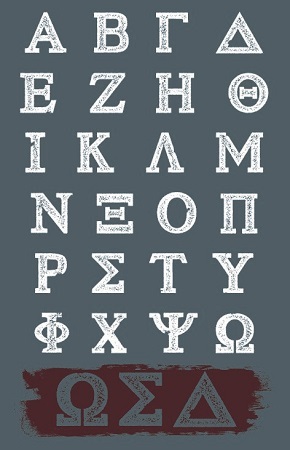 The Greek alphabet is the oldest alphabet with a clear distinction between consonants and vowels. The Greek alphabet that is used for language is also used as labels for many mathematical and scientific equations. The Phoenician alphabet is the oldest recorded alphabet consisting of line-symbols to replace Babylonian, Egyptian, and Sumerian hieroglyphs. It was developed by merchants so that trade between civilizations would be possible. This alphabet spread quickly in the Mediterranean, and was eventually assimilated and modified by all the major cultures in the region, giving birth to languages such as Arabic, Greek, Hebrew, and Latin. Keep in mind the Archaic letter/symbol Digamma (Ϝϝ) is sometimes used. Digamma sounds like the English letter W.
There are many more uses of these symbols in math and science. The table above barely scratches the surface. Performing an internet search by a specific field of study will help you discover what the symbols represent by discipline. You can find tons of indexes of math and science symbols online. Additionally, many science vocabulary words use common Greek roots.